GZS Campus College of Engineering & Technology, MRSPT University, Bathinda is the first institute in Punjab established by state government in the year 1989 when the hon’ble Governor of Punjab Sh.S.S.Ray laid the foundation stone on 23rd October, 1989. Initially set up as Government Engineering College, it was converted in to an autonomous institute in the year 1992 and a “Board of Governors” (BOG) was constituted to manage the affairs of the College. This college was made a campus of Punjab Technical University in 2011. Now the campus is a constituent college of newly setup Maharaja Ranjit Singh Punjab Technical University, Bathinda and is recognized by All India Council of Technical Education (AICTE) & Council of Architecture. The institute provides an excellent academic environment under the able guidance of well-qualified and highly dedicated faculty. GZS CCET MRSPTU, Bathinda has the distinction of being the premier degree level technical education institute established by Government of Punjab with the operational control of Board of Governors headed by the Hon’ble Minister of Technical Education, Govt. of Punjab. This institution has been engaged in shaping the destiny of budding engineers ever since it came into being in the year 1989. The College has a magnificent infrastructure spread over an area of 162 acres, which has been witnessing continuous developments since last many years. This College is an excellent education centre with state of-the-art laboratories, computer centre, library and workshops. The college is continuously striving hard to achieve excellence in imparting good technical education with the help of its highly qualified and dedicated faculty, which is considered to be the best in the region. The mission of the institute is to create sustained learning environment of acquiring technical knowledge and translating theoretical knowledge into practical applications. Orientation Program for Ist Year Students and interaction with their parents is to be held in Conference Hall on 01-08-2018 at 11:30 AM. 1. Department of Textile Engineering, GZSCCET is going to organise 6 weeks (from1/11/16 to 10/12/16) Finishing School on Apparel and Fashion Technology. Disclaimer : GZSCCET, MRSPTU Bathinda tries to keep the information on its website(s) accurate and up-to-date. However, we cannot guarantee that information will always be up-to date. 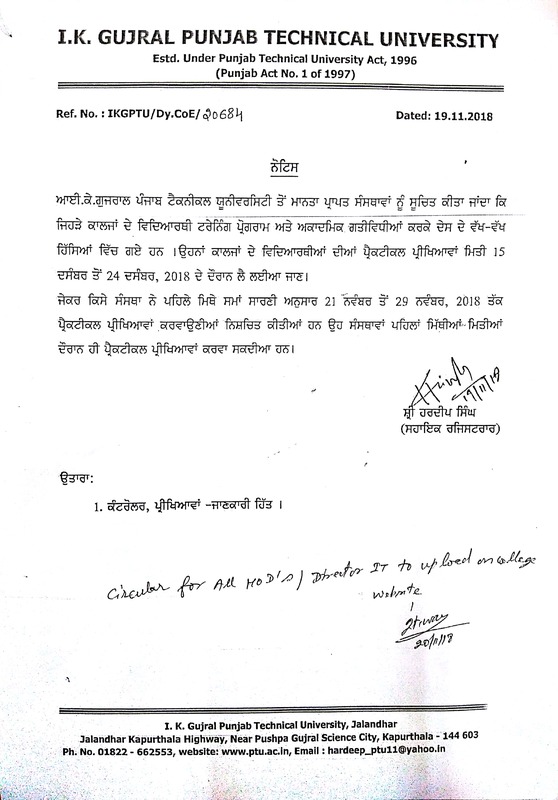 If you see something in a GZSCCET, MRSPTU Bathinda webpage that needs correction or updation, please contact us. Copyright © 2012 with GZSCCET, MRSPTU Bathinda. All Rights Reserved.